Would you love to learn a new language? Check out our Rosetta Stone for kids review. Learning Spanish has always been near the top of our family’s to do list. Yet, somehow, life gets in the way and we’ve never seemed to get around to it. So, when our family finally resolved to make a real effort to learning Spanish, Rosetta Stone was the first name that came to mind. Rosetta Stone has taught language learning for over 25 years, and they’re trusted by businesses and police departments nationwide. 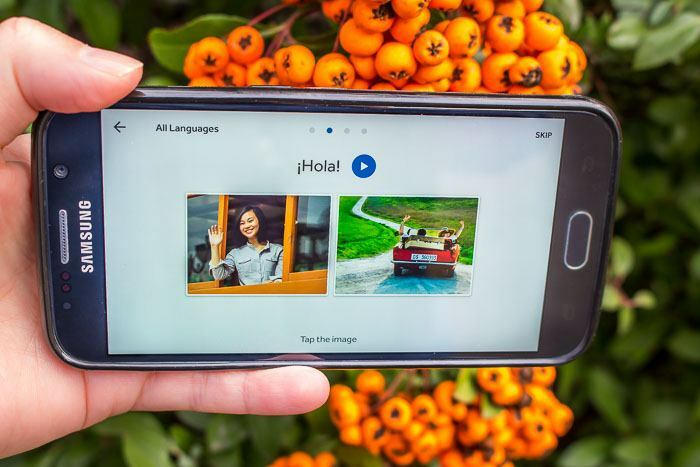 Even better, they have a shiny new subscription service that will let our family of four learn Spanish on our smartphones, any where we are, at any time of day. I first used Rosetta Stone years ago. It was so long ago (and I’m not sure I want to admit this) that I needed to load it onto my desktop computer using a floppy drive. Remember those? Internet was around, sure, but it sure wasn’t fast enough for digital downloads. I had great success using it in the first few weeks, but then got an unexpected early acceptance letter for university. Being a full time science student with seemingly endless hours in the lab unfortunately meant that learning a language had to drop a little further down my priority list. I always remembered how much fun Rosetta Stone was, and how much I enjoyed the lessons. They felt organic, as if I was learning in a way that made sense. 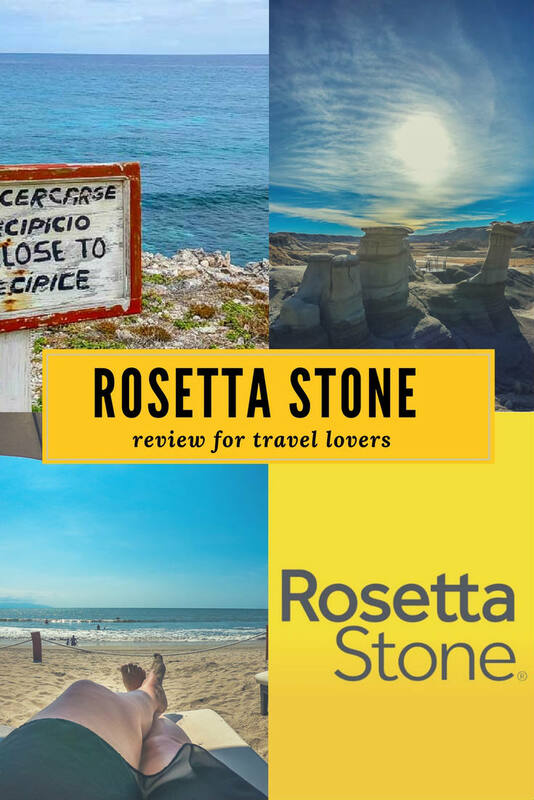 So, when Rosetta Stone reached out a little while ago to see if I’d talk about them here at The Parent Spot, I was thrilled. This was the perfect chance to try out Rosetta Stone for our family of four: me, the kids, and my husband. All four of us have been wanting to improve our Spanish, so it’s time to pick up language learning again. These days, Rosetta Stone is very much in tune with our smartphone lifestyle. You can use your a Rosetta Stone subscription on desktop, tablet and mobile devices. The subscription gives you the flexibility to learn another language on your schedule, with any device, from anywhere in the world. You can even download lessons to your mobile device to continue learning offline. I was pretty impressed with my first look. 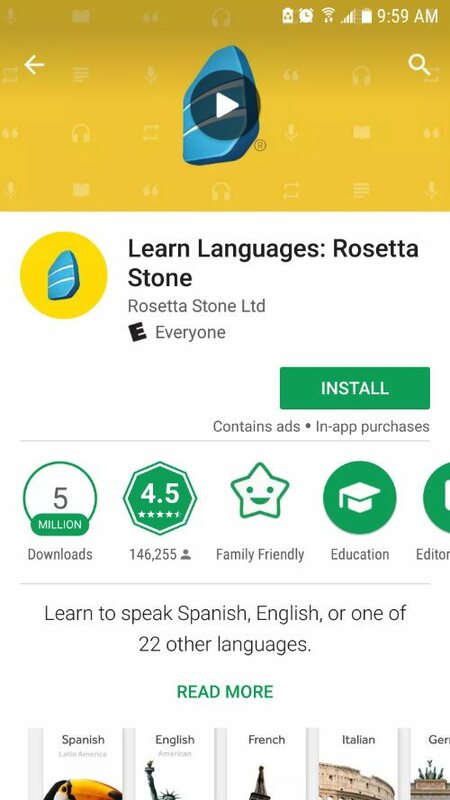 The Rosetta Stone app has been downloaded a whopping 5 million times, and it app rates over 4.5 out of 5 with over 145,000 reviews on the Google Play store. That’s pretty darn impressive. We all know we love a good app, as seen in our fun Plantsnap app review and GoHappy app review. How does Rosetta Stone work? Rosetta Stone teaches you the way you learned your first language. Think about how children learn their native language. They never learn with the help of translations. Instead, they learn words and concepts within their surroundings. I found that for the kids, especially, the way Rosetta Stone taught was incredibly intuitive. That’s how Rosetta Stone works. It’s a natural way of learning where you start to think in your new language. With Rosetta Stone learning, you learn through a combination and words and images to help you understand what each new words means. Subscriptions come in 3, 6, 12 and even 24 month packages. 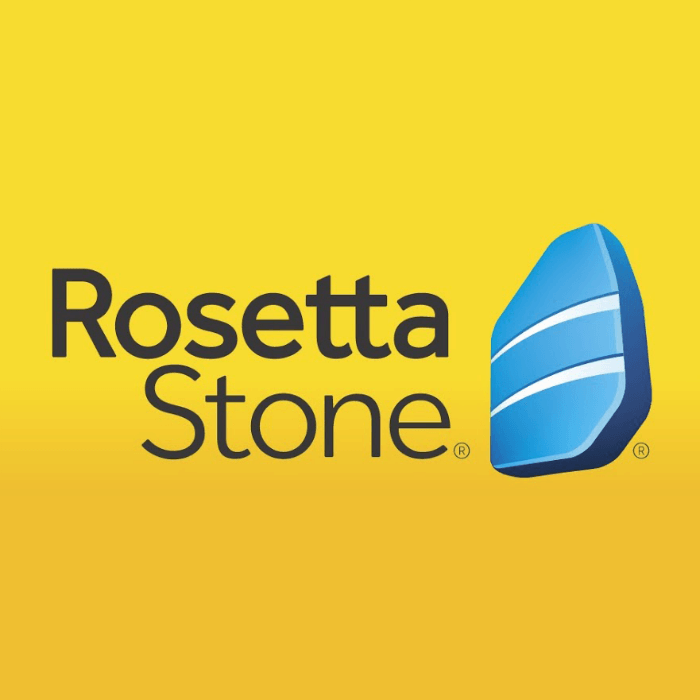 Your subscription allows you to access Rosetta Stone on your desktop, tablet and mobile device. You can even download audio lessons, for those times that you’re not near an internet connection. There’s even a great homeschool Rosetta Stone plan for the family for $5.99 for 24 months. See prices and details for the homeschool Rosetta Stone option for the family. There’s also a money saving 24 month family pack for Rosetta Stone. It’s 12.99 a month (based on a 24 month subscription), and includes 3 licenses. See prices and details for the Rosetta Stone family plan here. I love that lessons are based on practical examples used by real travelers. 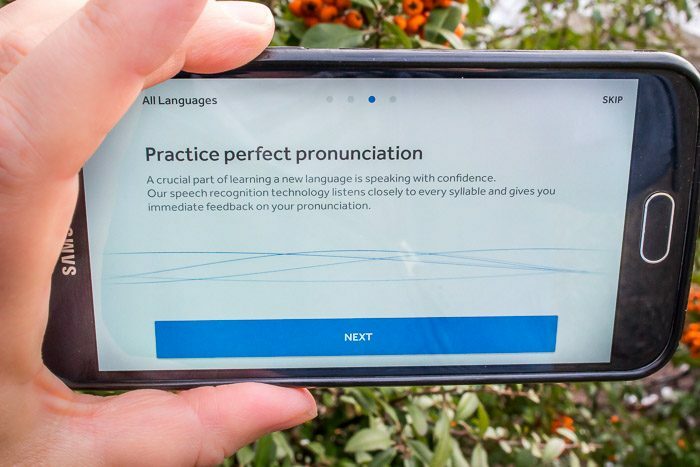 There’s helpful pronunciation training that’s incredibly accurate, so you’ll sound more and more like a native speaker as you progress. There’s a learning community where you can speak to other people who are also learning your new language. You can play even games, read stories and more. 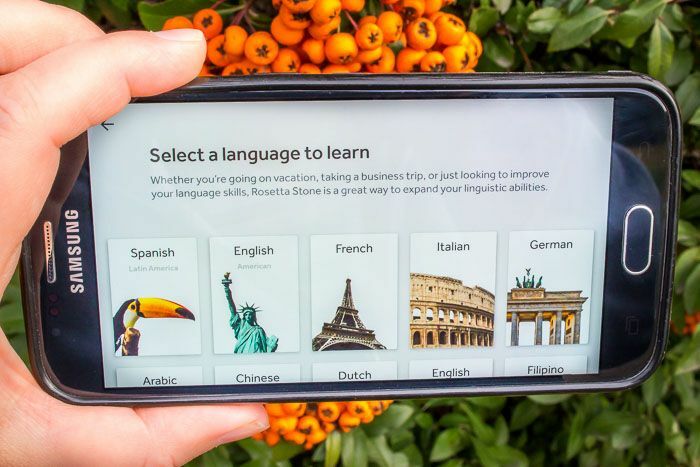 Check out this video that tells you a bit more about how the Rosetta Stone Learn Languages app works. Language tutoring with a Native Speaker! One feature that I especially love is that you can schedule sessions with tutors who are native speakers. The entire tutoring session is spent speaking in your new language. This is the perfect gift for anyone who’s interested in learning another language. Subscriptions come in 3, 6, 12 and even 24 month packages, and you get the flexibility to learn another language on your schedule, with any device, from anywhere in the world. You can even download lessons to your mobile device to continue learning offline. Want to try it out first? Click here to try the Rosetta Stone Free Demo. Find out more on the Rosetta Stone website, or follow them on Facebook, Twitter, YouTube, or on the Rosetta Stone blog.